Thanks to generous grants from The Cannon Foundation, Duke Energy and the Polk County Community Foundation, Outreach will be getting much needed building updates in 2019! Click this link to our 2019 Outreach Renovations page to learn more about this project and check out before and after photos! 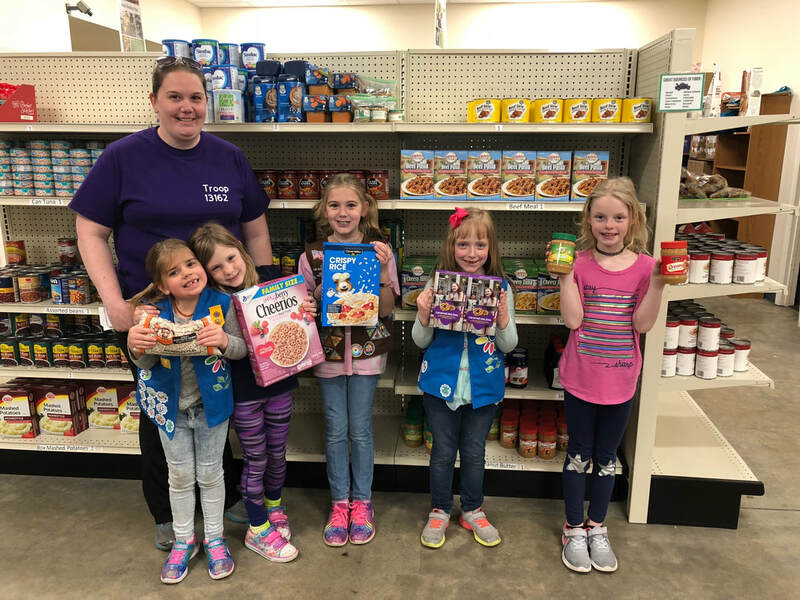 Girl Scout Troop 13162 paid Outreach a visit in late March to learn more about the services we offer and to hear how our food pantry works. These smart girls asked great questions while they were with us and learned how simple it is to help others everyday with a kind word or a smile. This caring, cute group even brought us gifts - they left delicious girls scout cookies, peanut butter, jelly and cereal for our food pantry shelves. Thank you again girls! Neil Rostick is this year's recipient of the NC Nicholas Green Award for his achievement in community service. Neil elected to donate his monetary award to his two charities, Outreach and Paws, Prayers and Promises and to his 6th grade Language Arts teacher to purchase novels for her classroom. Neil has volunteered at Outreach for several summers helping to pack and deliver Feed-a-Kid bags to local children each week. Outreach is honored to be one of Neil's chosen charities. Congratulations Neil on this wonderful accomplishment! 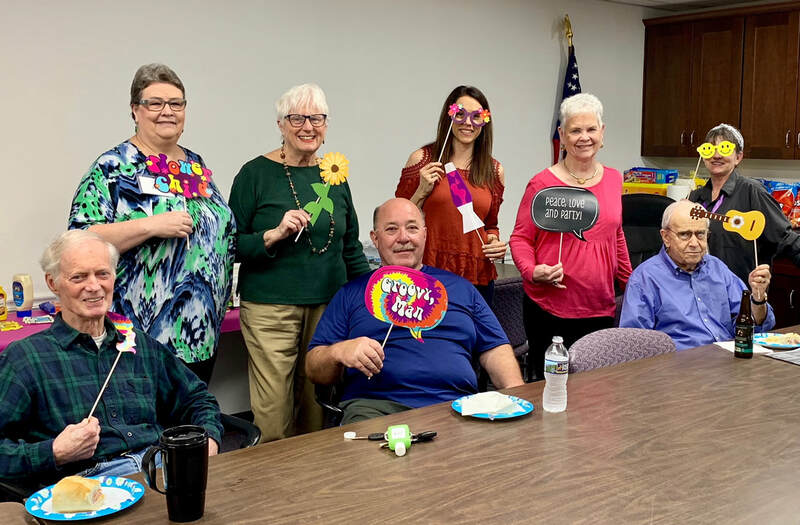 Fun times at Outreach recently, when Unity in the Community's Board of Directors came for a visit to deliver food collected during their annual food drive - 1,460 pounds of food were donated! Outreach's Board of Directors were one hand to help unload the truck. All together, Outreach received nearly 900 pounds of food to stock food pantry shelves - very grateful!! Saluda Elementary School held their own contest between the Patriots and the Rams. Students brought in canned food items & loaded them into the team's box they supported. The Patriots won this contest as well, edging out the Rams, 131 to 124 pounds of canned food. Signs made by Congregational Church Youth to promote their Souper Bowl Chili sale. Congregational Church Youth hosted their annual chili sale - church members make chili for the youth to sell after church on Super Bowl Sunday. Outreach Pantry Coordinator, Vennie Abrams with all the canned soups and chilis that were donated to Outreach for the Souper Bowl of Caring. Help Wanted - Volunteers Needed! We need your help! Volunteers are needed to staff morning (9:00 - 11:30 AM) Client Intake shifts each week. Intake volunteers interview potential and current Outreach clients as they come in for services. Intake is a great way to connect with Outreach clients and can be very rewarding. Outreach extends heartfelt thanks to The Cannon Foundation for the recent "Human Services" grant award to be used to complete important updates to our building. Check out our 2019 Renovation page for the details of this project and to track our progress. We are grateful to The Cannon Foundation for investing in Thermal Belt Outreach! Thank you Polk County Community Foundation for awarding Outreach a "Seasonal Assistance and Cheer" grant. Thanks to this grant, Outreach was able to purchase Thanksgiving meal gift cards and gifts for children on our angel tree. Thank you PCCF for your generous and continued support of Outreach programs and services! Did you know.... Outreach now has a texting service to communicate with our clients? This service will be used to send important Outreach news and updates on programs and special events. It's simple to register - text 21000, type Outreach in the message and press send.